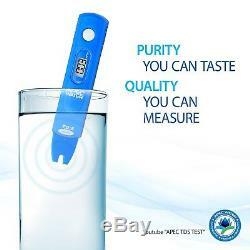 Healthy, Great Tasting, Ultra-Pure Drinking Water. Right from your kitchen tap! 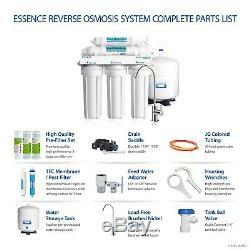 This complete reverse osmosis water filter will produce an unlimited supply of bottled-quality drinking water while removing any chlorine, unpleasant tastes, odors and up to 99% of harmful contaminants to produce clean and refreshing water that everyone will enjoy. This will improve the flavor of coffee, tea, and ice cubeseverything tastes better with RO water! Highest Quality & Competitive Performance Guaranteed. With two decades of experience in reverse osmosis system design and production, ROES-50 offers the reassurance of premium quality components and contaminant rejection that is more efficient than any other competitor. Enjoy worry-free comfort knowing your health will never be compromised with our ROES-50 system. Designed, Engineered and Assembled In The USA. APEC has 20 years of successful experience in creating the finest water filtration systems from our California facility. 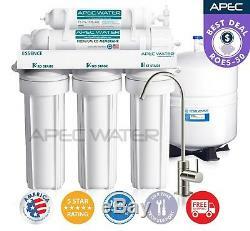 All APEC reverse osmosis systems are designed, engineered, assembled, and tested in-house using high-quality parts to ensure that a trouble-free system arrives at your door. Our superior engineering, design expertise, and attention to details have earned our products the distinction of being the most durable water-filtration systems on the market. 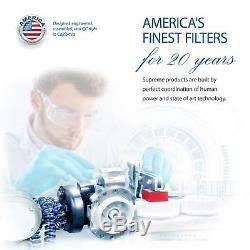 Large Capacity Block Filters For Longer Filter Life. Every ROES-50 is equipped with industry standard-sized solid block filters that offer longer filter life and a higher contaminant rejection rate when compared to other types of filters on the market. Stringent Quality Control Process = Peace Of Mind. All systems are put through a rigorous multi-point quality control process to eliminate even the slightest component imperfections. This system will provide you with the ultimate satisfaction and peace of mind with a reliable operation that is free from noises, leaks, and clogs. Easy Do-It-Yourself Installation & Maintenance. ROES-50 is made with simple installation and maintenance in mind. It is equipped with quick connection fittings and colored tubing, which make system installation and maintenance extremely fast and easy. Fully automated system will effectively treat tap, well, and hard water at variable water pressures with extreme pH and hardness levels. System uses industry standard parts and components, which makes finding and replacing any part or filters on the unit simple and cost-effective. Fully scalable and upgradeable making it a great investment for a growing family. Referral program pays big, so you can have "free drinking water" forever! High Performance 5 Stage System Components. Sediment removal filter removes dust, particles, and rust. Protects and extends the life of the membrane and system. 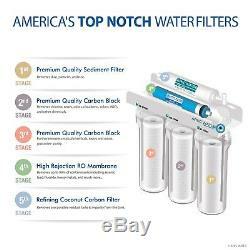 Carbon block filter gets rid of unpleasant chlorine, tastes, odors, cloudiness and colors. Also removes VOCs and other common chemicals from the water. High Rejection TFC reverse osmosis membrane. 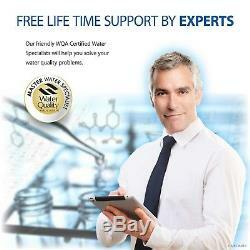 Removes a wide variety of contaminants including arsenic, bacteria, lead, fluoride, chromium, radium and more. Coconut Shell Refining Carbon 10 filter removes any possible residual taste from the tank. 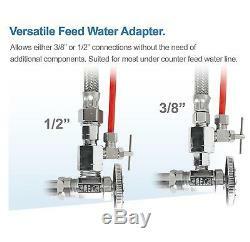 Standard with system: Quick Connection fittings; stainless steel check valve; clog-free flow restrictor; 5 feet of food grade tubing; ½ input feed water adapters. 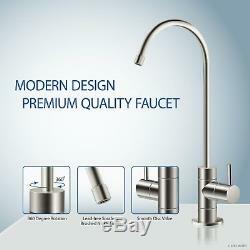 High quality lead-free faucet & 4 gallon pressurized tank also included. Wrench, tank ball valve, feed water valve, drain saddle, Teflon tape, and manuals. Ice-maker kit option is available at checkout. Feed Water pH: 2.0 -11.0. Feed Water Pressure: 40-85 psi. Feed Water Temperature: 40-100 deg F. Max Total Dissolved Solids: 2000 ppm. System Dimensions: 16"w x 5.25"d x 17.5h. Tank Dimensions: 11" x 11" x 15. System Package Weight : 26 lbs. 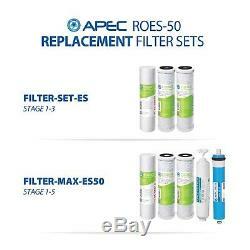 The item "APEC WATER SYSTEMS 5 Stage 50 GPD Reverse Osmosis RO Water Filter System ROES-50" is in sale since Tuesday, October 14, 2014. This item is in the category "Home & Garden\Kitchen, Dining & Bar\Small Kitchen Appliances\Water Purification\Water Filters". 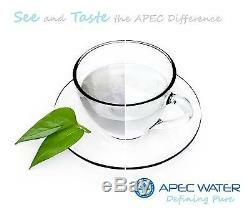 The seller is "apecwater" and is located in Hacienda Heights, California. This item can be shipped to United States.